In Britain, as in countless countries all over the world, Valentine’s Day is one of the most beloved holidays of the year. A time when loving couples exchange cards and gifts, taking time out to reconnect with each other and to rekindle the flames of passion, February 14th is widely celebrated across the length and breadth of the country. Shop windows on high streets all over the nation are filled with inspirational gift ideas, and everywhere there are images of hearts, flowers and cupids, conjuring up a sense of magic around the occasion. We may celebrate Valentine’s Day in this way today, however this has not always been the case. Although it has been well known as a festival for generations, it is only in recent years that couples have expressed their adoration through the exchanging of tokens. In this article, we look at the ways in which Valentine’s Day has been honoured over the years and the changes that have taken place through time. The earliest origins of St Valentine’s Day appear to be founded in the pagan festival Lupercalia, held to celebrate fertility rites. This Roman festival, which took place between the 13th and 15th February every year, involved naked men racing through the town and hitting young women with their whips to boost their fertility! The Christian church soon hijacked this festival, and several Christian martyrs, all with the name Valentine, appear to have gone to their deaths on 14th February. 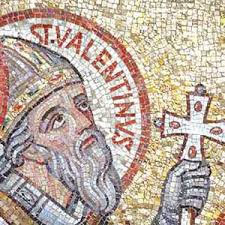 The holiday was then formally declared as a Christian feast day by Pope Gelasius in 496 AD, and was named after St Valentine. It was in England that the earliest text which linked St Valentine’s Day with love was written. Geoffrey Chaucer, a poet in the 14th century, wrote a poem to celebrate the king’s engagement to his wife to be, Anne of Bohemia, and in it he referred to birds choosing their life mates on Valentine’s Day. It was also in 14th century England that the earliest surviving Valentine’s letter to a woman was written, although it was a Frenchman who sent it. The Duke of Orleans, who was imprisoned in the Tower of London after being defeated in the Battle of Agincourt, sent a poem to his wife telling her how much he loved her, and in the script he referred to her as “my Valentine”. By the early 17th century, it is clear that the tradition of romantic love on Valentine’s Day was well established since it is mentioned by the character Ophelia in Shakespeare’s play, Hamlet. In the 18th century, it became common practice for sweethearts to exchange love notes on February 14th, and this tradition had become so popular that a book called The Young Man’s Valentine Writer was published in 1797. It was full of rhymes which gentlemen who struggled to make up their own verses could use to impress their object of affection. The arrival of the Penny Post in 1840 meant that sending Valentine’s Day cards was easier than ever. Printers nationwide began to mass-produce cards which men and women could send to their significant other, and the postal service meant that it could be completely anonymous meaning that lovers could be a lot more expressive than they could in person due to the strict Victorian customs of etiquette. Giving floral gifts also became more popular, with couple’s conveying secret messages to each other using the language of flowers. In the 1980s, the holiday began to take a more commercial twist, with jewellery stores getting in on the act to promote their products as the essential lover’s gift. Today, Valentine’s Day is as popular as ever thanks to the romantic nature of the occasion. Established couples everywhere enjoy reminding each other of their love by presenting their partner with a card and a present, while those who are hopeful of attracting the attention of their object of desire send flowers and love notes in the hope of winning their affection. February 14th has become an extremely commercial occasion in the modern world, with countless mass-produced gifts and cards on the market to choose from. It is estimated that over 1 billion Valentine’s cards are sent out worldwide and more people than ever choose to buy their loved one a present online rather than shopping in-store.